After couple of visits of going up and down Pejabat Pendidikan Wilayah Persekutuan and the school.. finally after a month of schooling at my alma mater, Adam change to the school closer to home.. easier to manage especially the picking up and sending to Sekolah Agama in the evening part.. It came by a surprise, Adam was totally shocked that he have to move school.. new environment.. new friends.. I hope he can adapt well.. even his current class teacher was not prepared to let him go.. ahahahah.. such a favourite student eh?? So this is him on his first day at the new school.. I didn't realised his hair were that long before.. We noticed in in this picture and plan to take him for a haircut after this.. 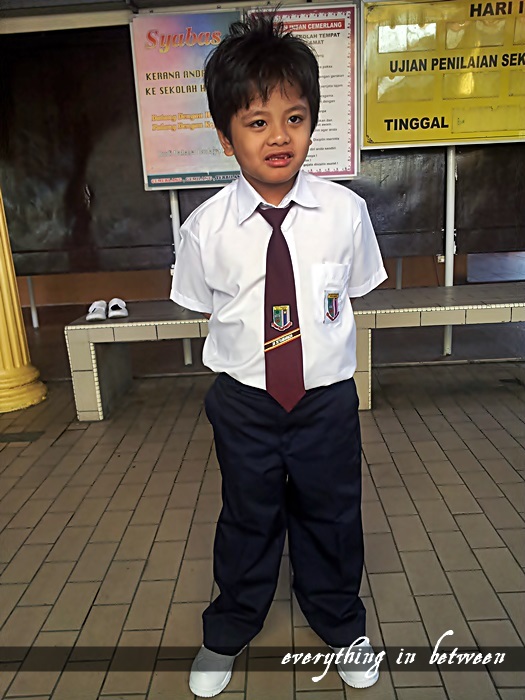 But he love this school instantly because... he get to wear the school necktie whereas at the current school he's yet to receive his necktie even after a month! We were asked to see the teacher that is incharge of Standard 1 students.. and she warn us about Adam's long hair.. she notice!! eheheh.. so 1st thing to do after school is haircut! She tested Adam reading skill just to set him to which class.. I thought of enrolling him for a chinese language class but all class are already full.. so arabic you go! Adam's class is on the top floor.. third floor!! it took me quite some time to reach his class.. mind you it is a very long time ago when I used to take the stairs.. why put technologies to waste?? kehkeh..
His class teacher seems nice, a soft spoken lady.. she teaches Agama Islam.. she told us about all the fees needed and whatever additional item.. and she told us to bring all Adam's exercise book to put at the class.. the kids only have to bring their text books home.. everything is kept at class.. good initiative from the school.. they even have lockers to rent..
After settle everything at the school.. and Adam is safe;y learning at his class.. we left.. and come back again to pick him up at 1.. I was the one who told him to wait at the staircase and asked him to wait until I come.. and he said okay.. then the panic moment came.. I was waiting for him at the stairs but he is nowhere to be seen.. the very last Standard 1 student already came down the stairs.. But at the corner of my eyes I saw a familiar bag walking happily with his friends.. he was actually following his friend who is taking the transfer van to home.. I was shouting calling for his name like a mad lady.. and I was running.. almost cried.. suddenly he turned and smiled.. and he whispered something to his friends and walking towards me.. Such a relieved.. he said he just wanted to follow his friend.. I made him promise to not do that again.. just wait at the place that have been agreed earlier.. So there you go a drama to end his first day at a new school..